« Where Does Time Go?! Yard Sales have been pretty “blah” so far this season. Maybe it is me, but I don’t think so. They’ve just been “blah”. I stopped at one last weekend that I can usually rely on (a church’s garage sale in the church parking lot). It was pitiful this year. I picked up a few items, all unmarked, and asked how much. She hesitated and I knew she wanted to say, “a piece” but she relented. How much for the nice photo frame? And for the unfinished 11×14″ frames? I put those frames back. The deer, I bought. I pulled all the lights out of them (“For Indoor Use Only – now why would I want to use the reindeer indoor? My living room is only 20×12′). 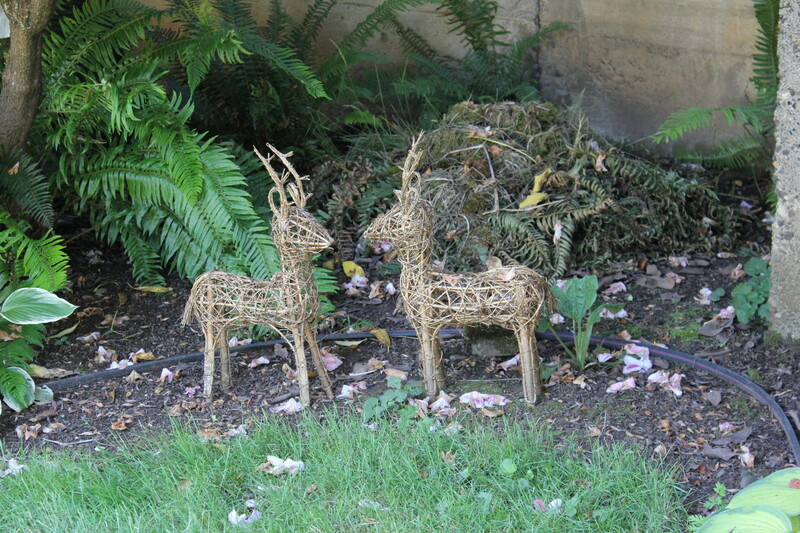 I wanted them for summer use in the garden, anyway. They weren’t really worth $5, but I like them. My husband just rolled his eyes. This weekend, I found something I wanted, not at a yard sale but at our local Goodwill Store. I eyed it good and long yesterday but I didn’t buy it. I wasn’t certain it would fit into my car, to begin with, and I kind of wanted to run it past my dear husband before I invested in it. Today I decided that if it was still at Goodwill and I could fit it into my car, it was coming home with me. I packed a measuring tape and my wallet with me. I measured the bed of my car with the seats down: 67inches. So if it was any taller… Well, I could scoot the passenger seat all the way forward. I closed the hatchback and said, “Well, looks like it fit.” Grinning, because I carried the measuring tape. I used my Goodwill Card. Got 5% off the Goodwill price. How pitiful is that? Getting a discount on already discounted merchandise? I love my Goodwill card: I get a bigger discount on my birthday month. There’s something about feeling like you got a screaming deal that hooks me. $37.99. 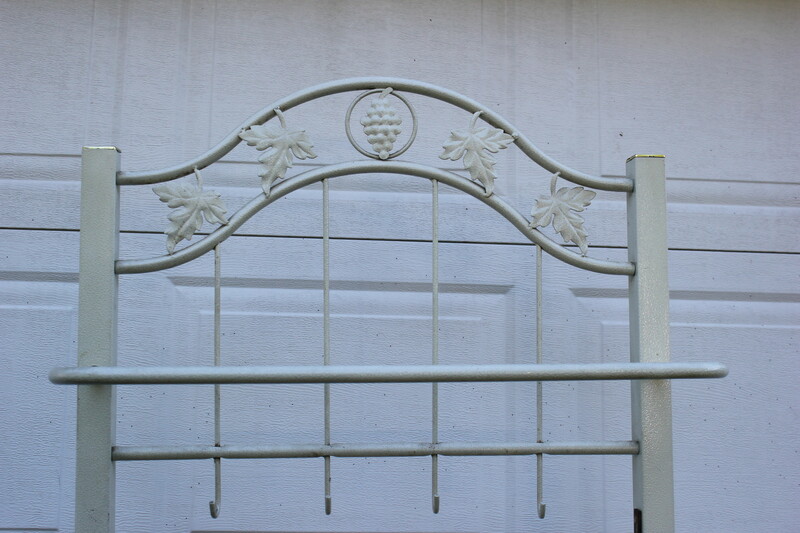 That’s what I paid for this painted wrought-iron baker’s rack. At first, I thought I would plant it in my flower beds and turn it into a potting bench. 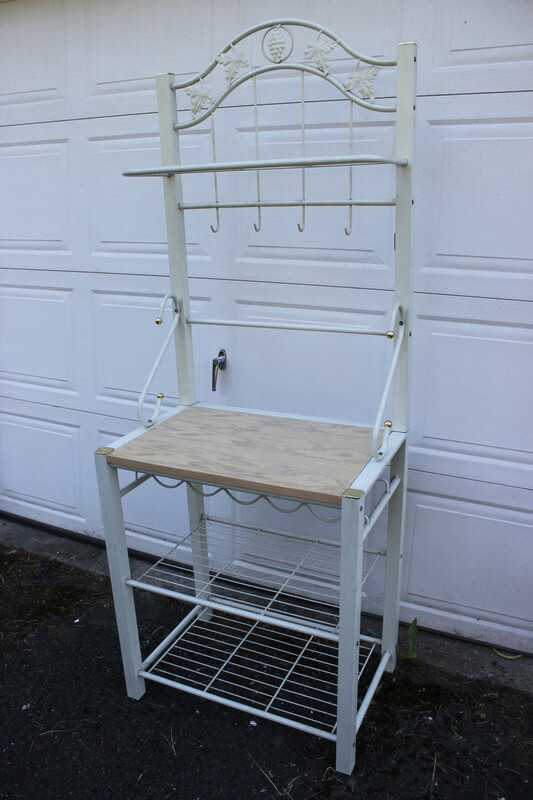 But after I pulled it out of my car (it’s amazingly light weight which means it is probably not really wrought iron under that paint, but I’d already discerned it was a far cry from an antique), I started thinking that maybe – just maybe – I could use it in my kitchen. I could make room for it. It has a certain country charm to it. I have one in my kitchen and love it. It holds the wine glasses, place mats and napkins and a TV!